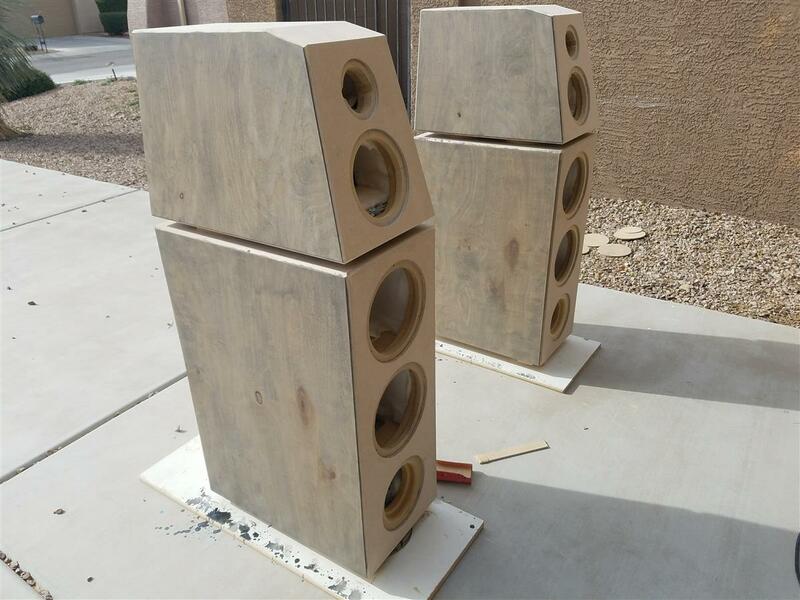 The speakers are done! I’m super excited to finally unveil the completion of the DM-4 Reference Loudspeaker. It’s been crazy though, the last few months have been such a roller coaster of different, unexpected projects, as is evidenced by my last few posts. It seemed like with each new project this speaker build kept getting put off more and more. At some point I said to myself, I just need to finish a couple of these other things on the to-do list and then hit the speaker project full-time and just get them done. This has probably been the longest time I’ve spent doing a single speaker build. From conception to completion this project taken almost 3 years. It got the point where in the middle somewhere I completely lost interest in the whole project and began designing a completely different set of speakers. But alas I persevered and now I can say that I am super happy I did because these speakers turned out amazing! Well, in looks at least. As of this post I haven’t hooked them up and actually listened to them yet aside from my initial tuning of lower enclosures which I did a few months ago. The method for creating the crossovers and doing the measurements will have to be saved for another post. For now I just wanted to get the rest of the build pics up and of course the final shots of them sitting in my living room just looking awesome. It’s funny because as with so many DIY projects, at some point you just have to accept the little flaws in a project and recognize that this thing is made by the hand of an imperfect person. I know I get way too picky about the fit and finish of the final product that can’t enjoy it for what it is. Overall these speakers went together without too much fuss. 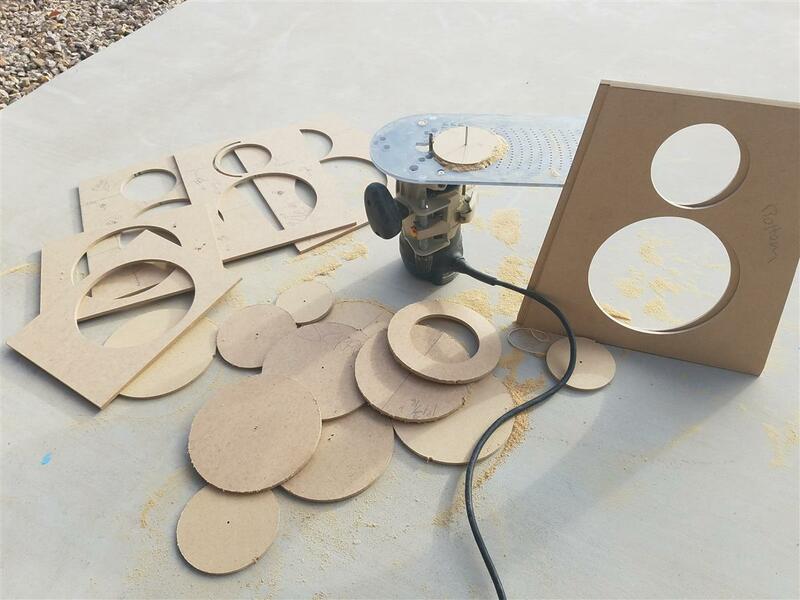 I’ve been working with wood and MDF and building speakers for many years so I’ve come to understand what it takes to get the job done without making too many mistakes. But when it comes to the final paint and finish work, I’m a complete mess. For this project things were looking good all the way up until I added the Polycrylic clear coat. Staining the birch was a piece of cake, it went on like any stain, really cleanly and looked flawless once complete. I went out on a limb and did the black surfaces with just spray paint and to my surprise that also went on really well. I think I did 3 coats of gray primer and then 2 coats of flat black. I had masked off the birch while spray painting and when I lifted the masking for the first time I got a glimpse of what these speakers were going to look like and I was super excited. 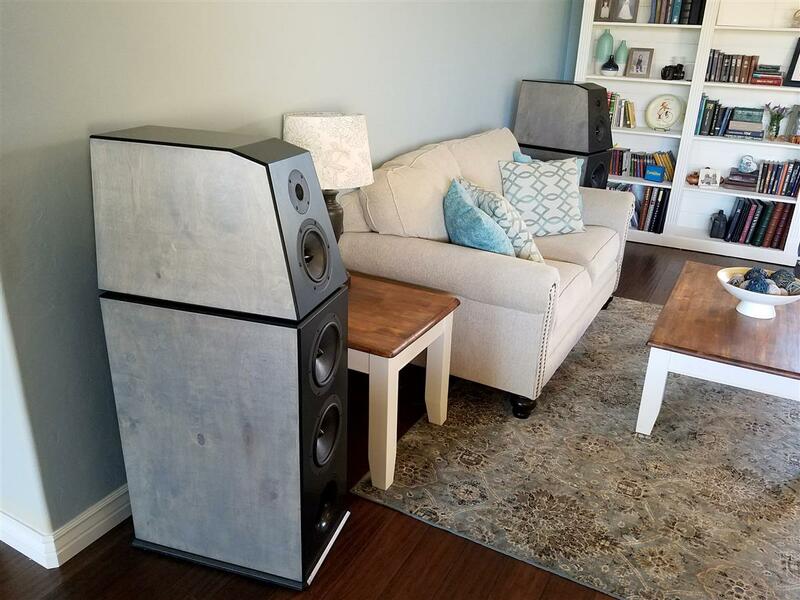 The gray stain contrasting the black just made a killer combination that just looked different from the usual speaker. So I was excited and pumped to put on that first coat of clear coat to give it that clean, smooth, subtle shine to it. This is where it all fell apart. I seriously have to find a better method for clear-coating speakers. There has to be a better way. I won’t go into the details, but I ended up with 4 coats before I just gave up and said it’s as good as it’s going to get. After each coat I’d find a drip, or a spot where I’d brushed it again when I shouldn’t have, or a spot I missed completely. So I’d sand it down and put on another coat, only to miss another spot, over-brush a different spot and end up with a run somewhere else. After sanding down that coat and doing it again and again I just quit and said it is what it is. So that’s when I decided you know what, they’re not perfect and overall they look as good as I ever could have expected them to look so I’m just going to say that I’m happy with them for now. But if and when I learn how to do a proper clear coat, I’ll remove all the drivers, sand this top coat down once again and finish them proper. But that’s down the road, like, way down the road. Well I should do a write-up on the final build of these speakers. They definitely deserve it, there are so many little details that went into every aspect of making this speaker. You can probably gleam how they were built from all the pics but a few words won’t hurt. I’ve already written quite a bit leading up to this point. A lot of finishing these speakers is just duplicating what I did to the lower cabs. I had just finished building the upper cabinet when I stopped late last year. So I will pick up this post with adding the 1/4″ MDF to the front/top/back/bottom and cutting the 45° chamfer around the edges. The 1/4″ MDF worked out great and gives a clean finish to work with as far as painting goes. Plus it allowed a perfect flush fit for the Dayton Audio drivers. I used Parts Express’s sweet Jasper Jig Model 240 to router perfect holes for the woofer and tweeter. This took a lot of trial and error though! I think I went through 5 different boards before I found a size that allowed the drivers to fit just right without the gap being too big or too small. I was shooting for a gap that was at least 0.005″ but no more than 0.015″. That’s basically a baffle diameter that is 1/32″ larger than the diameter of the driver basket. This allows for some growth from paint/clear coat but no so much that the driver can actually move around. The smaller the gap, the better the finished speaker looks, in my opinion. I did error on the smaller side for the tweeter and I had a tough time getting it fit after the 4 coats of clear coat that lined the inside edge. But since it is probably the only driver anyone is really going to look at, I wanted to make sure the transition from the tweeter’s faceplate to the baffle was absolutely seamless. Plus with the Jasper’s fairly course 1/16″ increments (or 0.062″) I didn’t have much choice with the tweeter as one size was spot on at 0.000″ and the next size bigger left a whopping 0.0315″ gap around the whole tweeter. That was more than double what I had already agreed was reasonable from an aesthetics perspective. So I cut it with no gap and then sanded it slightly to get the tweeter to fit. I then just tried to be careful with the paint and clear coat so as to not decrease that size too much. It worked out, because the tweeter fit by the skin of its teeth and the gap is nearly zero. The next step was adding the acoustic insulation – I reiterate what I had stated about doing this insulation technique on the lower cabinets that it was an absolute pain and was super time consuming but I think in the end it is going to provide superior damping and absorptive properties than some of the traditional (and simpler) methods. I took a bunch of pictures of each layer going into the cabinet and then made a “sample coupon” on a separate piece of MDF just so show a cool cutaway view of the built-up layers of materials. In short each upper cabinet is covered with 2 layers of 1/2″ (6-lb.) 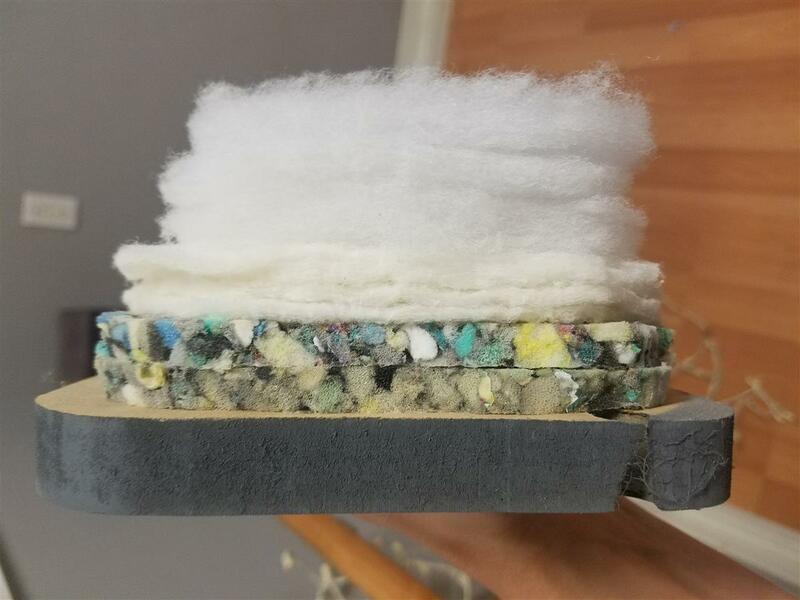 standard carpet pad following by 4 layers of a 80/20 cotton/poly blend fabric/fill and then 4 layers of a 100% poly batting material. The total thickness ends up being almost 3″. Each layer is glued onto the previous layer with spray glue to create one cohesive material that won’t move around and hopefully provide consistent absorptive properties throughout the enclosure and in both enclosures. The upper cabinet is sealed and will have an approximate high-pass filter of around 200-400 Hz so for the most part I was shooting for a nearly-full enclosure, but still ended up with a solid pocket of just air with no fill in just the middle portion. So it’s probably like 75% filled if I had to guess? The lower cabinet only has the walls lined and is probably only 15% filled. Alright so now the cabinets are done it’s time to start working on the finish. I picked up a can of Winwax “Classic Gray” and put 3 coats of stain the on birch sides for all four speakers. I didn’t bother masking the bare MDF since I was planning on painting it anyway. I should have stained those raw MDF edges better though because the spots I overbrushed with the stain actually sanded nicely and cleaned up that rough MDF edge look and then painted even better. But I did what I could to sand the bare MDF edge so it didn’t look like crap. In the end they are not perfect, I could have done some better edge prep, but they look fine overall and am not going to worry about it too much. After letting the stain dry I masked off the sides and began preparations to paint everything else. I picked up 3 cans of Painter’s Touch 2X gray primer and 3 cans of the flat black. Over the course of the next couple of months I went out to the garage and painted a coat of the primer, then sanded it, then did another coat and sanded it, until I had a really nice flat base finish. Then I moved on to the flat black paint. I also sanded between coats until I had a near-flawless black finish. This spray paint went on really well and I would definitely use this spray paint again. The flat black is extremely flat and I wouldn’t recommend it as a final top coat. It needs a satin or semi-gloss clear coat of some kind to finish it off. Once the paint was all dry I brought the speakers in the house for the first time. I didn’t want to do the clear coat/top coat in the garage because seriously anything that sits in my garage for more than 5 minutes is immediately covered in a layer of dust/saw-dust/paint-dust/you-name-it-dust. It’s not like I’ve got a 10,000 clean room at my disposal so the house will have to be good enough. I masked off the floor and my coffee table and set up the speakers for their first coat of Minmwax Polycrylic Satin clear coat. I’ve used this stuff before on countless projects and usually praise the ease with which this product goes on. It’s usually forgiving of brush strokes, provides a really consistent sheen across its surface and it’s water based so clean-up is a breeze. But I realized that painting over a solid black surface is not as easy. Every blemish in the coat was readily visible. Any imperfection in the base finish showed through and any area in the top coat that wasn’t applied perfectly evenly was visible when the light shown off it at certain angles. Thus began the paint-sand-paint-sand-paint-sand-paint nightmare that lasted about a week. And yes, with the speakers sitting in my living room just like this pretty much the entire time. Anyway, I called it good enough after that last coat and accepted the fact that once again I’ve nearly ruined a perfectly good project with a shoddy top coat. I started looking at past speaker projects and realized that none of them are perfect and that surely after a while I’d soon forget all about it anyway. I can say that birch sides look great. The clear coat went on and after only the second coat looked great. So I will say that real wood, with a grain and some texture to it, is way more forgiving of the irregularities in the top coat. But that solid flat black was something else. Especially since the fronts have the holes for the drivers, brushing around the driver openings and trying to get it look seamless was just a pain. I’m doing a spray top coat next time. I’m sure that goes on easier. Alright so now to the last part, the installation of the drivers! This part was probably the most fun. I took my time on this part, I did only a pair of drivers a day for basically a week until all four speakers were complete. I made up the internal wiring using 14 gauge 100% OFC copper wire and crimped them to a set of 0.250″ gold plated female disconnects from Parts Express. I went all out and bought the fancy Dayton Audio 5-way binding post kits with the black aluminum faceplates from Parts Express. These things look super nice and are definitely a step up when compared to a good old fashioned terminal cup. I won’t claim they offer much sonic benefit other than being a robust, gold-plated, low-loss connector, but they look stinking awesome and definitely match the high-end look of the speakers overall. I attached each disconnect to its appropriate spot ensuring I maintained proper polarity on each connection. I’ve been know to look right at a red connector and plug it straight onto the black connector like a moron. I took pictures of each connection just so I could be sure. 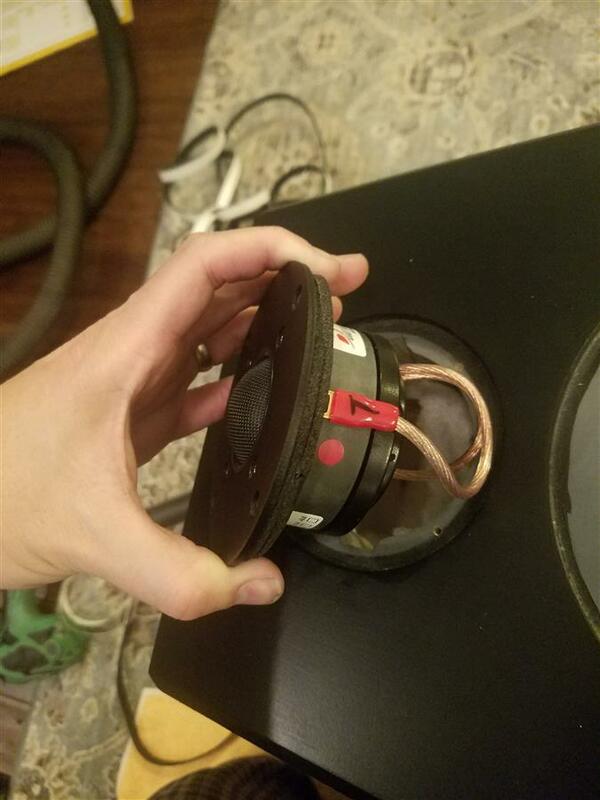 Nothing’s worse than trying to diagnose polarity issues in a speaker system via measurement techniques alone. It is possible though, but I’d rather not get into that situation where I don’t know if the polarity is inverted or not or double-inverted and therefore not inverted. The MiniDSP allows inversion of any of the 4 outputs so there’s flexibility in the processing to get the polarity right but it’s better that everything be correct from the get-go. I applied a strip of the 1/8″ x 1/2″ open-cell foam gasket to backs of the 7″ and 8″ drivers and applied two strips to the back of the tweeter, since the faceplate is thinner. The basket thickness of the woofers is about 0.210″ and my baffle thickness is 0.250″ which leaves 0.040″ (about 1mm) of uncompressed gasket to provide a perfectly flush fit. The gasket I received from Parts Express was actually about 0.140″ thick and was not easily compressed to 0.040″. (I had purchased another role of gasket but it was only 0.110″ thick and was significantly softer so I didn’t use it). It could compress more under the pre-load provided by the six (6) 8×1 screws but since I shooting for a flush fit I only tightened the screws enough such that the basket sat flat to the surface. This is the only downside to using just a piece of 1/4″ MDF to flush mount the drivers. The drivers are not seated tight against the baffle, I mean they are tight, but there’s still 1 mm of foam between the driver and the baffle. Normally you would tighten the screws super tight, or reasonably tight such that the gasket reaches “full” compression. Whatever that is, you decide. It’s not going to zero no matter what, so when you do design for a flush-mounted driver you have to account for some amount of gasket under the driver that makes it sit higher than just the thickness of the basket. As it is this material has a fairly soft durometer, it’s probably in the 20-30 region based on a Shore 00 rating, if I had to guess. Uncompressed the thickness is 0.140″ and and final compression in my design it is 0.040″ which represents a compression ratio of 71%. Honestly I couldn’t turn the screws much more to get that compression any higher without stripping them out. After all it’s only MDF with a pilot hole, I did not use any kind of hurricane nut or t-nut (I just find them way more hassle then they are worth for small drivers such as these). The drivers are definitely in there and the seal is surely air-tight. Taking them out later on will be a pain since I’ve found this soft gasketing material tends to bond itself to both surfaces once compressed and proved quite the challenge when removing drivers years later. Anyway, that pretty much brings me to today. The drivers are installed, the speakers are set up in their (probably) final location in my living room and so I snapped some pictures so I could show them off. Oh yeah, the other thing I ended up doing for the feet was I bought a set of sixteen (16) of the Penn-Elcom rubber feet from Parts Express. They are 1″ in diameter and 0.375″ tall. They were only 57 cents a piece and worked out awesome. I have wood floors so moving them around on the floor is a piece of cake plus they stick quite nicely. The top cabinet is definitely not going anywhere and the height it just perfect. So if you’re debating on getting a full set of toe spikes at 10x the cost, my recommendation is just go with the rubber feet. I doubt they provide any measurable difference in sound in the end over anything else but they are super easy to install and are essentially invisible in the final product. Here’s the gallery of pics starting with the upper cabinets and putting on the 1/4″ baffle boards forward to completion. I can’t believe this took five blog entries to complete. And I wrote a lot. I’m sorry for being so long-winded, but hopefully some of this information is helpful if you are working on speaker project of your own. There is so much that goes on behind the scenes with a good speaker design. I’ve only really touched on a handful of design concepts and ideas that I considered while making these speakers. Not to mention I still have to measure them and design the crossover for them, sot that’s all to come. Until then here’s a bunch of pictures of the completion of the DM-4 Reference Loudspeaker System! And if weight provides any indication of the build quality of a speaker, here’s the stats on these puppies: the lower cabinet weighs in at 96.0 pounds and the upper cabinet is 45.6 pounds bringing the total weight per speaker to 141.6 pounds! No wonder I nearly bust a gut every time I have to move these beasts. Click here to go to a complete gallery of final build pictures! 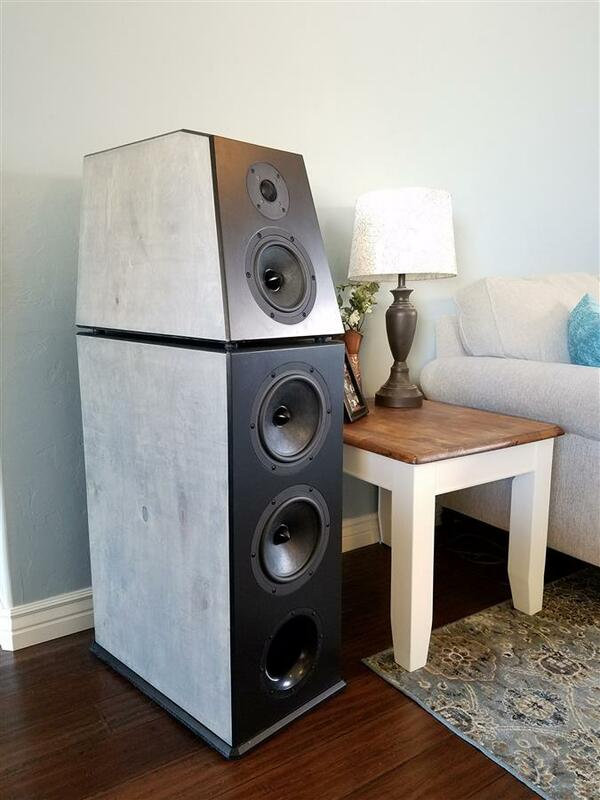 This entry was posted in Audio/Video and tagged active, audio, audio innovation, crossover, dayton, DIY, dm-4, hi-fi, loudspeaker, minidsp, parts express, reference, speakers, vr-5, watt puppy, wilson audio. Bookmark the permalink. One Response to DM-4 Reference Speaker Build Part V – Finally Complete! Dan, you popped in my mind today so I thought I would do a little research. Of course I didn’t need to look far to find you and your speaker projects. Looks like you finally made your dream speaker!!! I love it!! I remember you trying to measure the watt-puppies with a tape before the sales guy came back…hahaha I would love to hang out for a few hours and listen to those badboys with you!! Miss you bro.